WE HAVE HEARD of the early monastics: the demon-battling desert father Antony of Egypt; Simeon the Stylite perched atop his pole for year upon year; the brilliant, passionate Augustine; and the austere, irascible Jerome. Their lifestyles of severe self-denial may seem to pull against the truth that God made us ­human beings and called us “very good”—bodies and all. But if monastics really thought of the body as evil, then how is it that some of the greatest strides in the history of healthcare arose within monasticism? Monks cared for the ill in Benedictine monasteries, Franciscan leprosaria, the institutions of the monastic “hospitallers,” the many hospitals of the Augustinians, and so on throughout the history of monasticism. Gregory compared the Basileias to the Seven Wonders of the ancient world. But whereas the pyramids of Egypt and the Colossus of Rhodes had brought only worldly glory to those who had constructed them, Basil’s philanthropic foundation offered generous Christians an opportunity for spiritual blessings. Basil’s institution has gained a reputation as “the first hospital” not only because diseases were studied within its confines, but also because physicians and nurses treated sick patients there. Basil was born around 330 into a Christian family from Cappadocia in Asia Minor (central Turkey). His grandfather had suffered a martyr’s death during Emperor Diocletian’s persecution (303–305). Nonetheless, by the time Basil came along, his family commanded both wealth and prestige. His father owned estates in several cities and served as a professor of oratory (public speaking), the highest-status academic field in Greco-Roman society. As a result, Basil received the best education possible in classical rhetoric. Although raised in a Christian home, Basil wandered from the faith. A career-minded young man, he planned to rise in society by teaching oratory like his father and then pursuing a political career. But it was not to be. As he later wrote, “I had wasted much time on follies and spent nearly all of my youth in vain labors, and devotion to the teachings of a wisdom that God had made foolish. Suddenly, I awoke as out of a deep sleep. I beheld the wonderful light of the Gospel truth, and I recognized the nothingness of the wisdom of the princes of this world.” Gregory and other friends convinced him to be baptized and return to the church. Like many serious Christians of his day, Basil decided to pursue the path of asceticism, devoting himself to prayer and fasting away from the temptations of urban life. He toured the Eastern provinces of the Roman Empire in order to visit centers of Christian monasticism. In Egypt, Syria, and Palestine, he met austere hermit monks and saw coenobitic (community) monasteries in action. Basil finally decided to found his own monastic community in the Pontic mountains, north of Caesarea. The young man did not remain long in isolation, however. In 365 Basil was ordained a priest (presbyter) for Caesarea, and a scant five years later he was elected bishop. Now this dedicated monk saw his opportunity: he would create a new type of Christian monastery—one focused not only on the salvation of its inmates, but also on the physical care of the sick and poor. On his “monastic tour,” Basil had encountered an influential monk from Asia Minor, Eustathios, who convinced Basil that a true Christian monk should give up food, drink, and luxurious living not just to pray and contemplate God, but also to serve others. Eustathios founded communities of urban monks throughout Asia Minor and even in Constantinople. Unlike the hermits of Egypt who fled the world to dwell in the desert, Eustathios’s monks sought out towns where they could assist the poor, sick, homeless, and even lepers. Basil was captivated, and he worked out the principles of Eustathios’s urban monasticism in his own monastery and philanthropic complex at Caesarea. The community of men and women at the Basileias dedicated themselves both to worshiping God and to assisting the sick (whom Basil’s physicians attempted to heal) and travelers needing a clean, safe place to stay. Perhaps the most radical aspect of Basil’s community was its service to a particularly abject and hated class. As Gregory said, these unfortunates were “dead before death and have already perished in most parts of their bodies. They are driven from cities, homes, market places, and sources of water, even from their best friends. They are recognized by their names rather than by their bodily appearance.” These sickest of the sick, the Basileias’s most numerous patients, were likely ­lepers. Greek physicians had no idea how to cure them, but Basil felt they still deserved care. So alongside the beds for those with acute illnesses and the hospice for needy travelers, the bishop made a place for the lepers as well. Basil also tried to convince his fellow Christians that medical science was not opposed to God’s will but was God’s gift. From Hippocrates to Galen, Greek physicians had developed a sophisticated science (logos) of health based on observation, anatomical studies, and drug experiments. Modern scientists sometimes ridicule the ancient Greek system based on the four humors, but they overlook Galen’s masterful description of the muscles, tendons, and bones of the human hand. Some Christians, however, were uncomfortable with Greek medicine. First, it was associated with the cult of Asclepios, the healing god symbolized by a snake. The devotees of Asclepios hailed their god as savior, the same title Christians gave to Christ. Second, Christians were suspicious of medicine because it put its faith in human logos rather than in the Divine Logos, Christ. Basil countered these arguments by asserting in his monastic rules that medicine was a gift from God: “The prophetic writings, furthermore, utter this remonstrance to those who have not received admonition: ‘Is there no balm in Gilead? or is there no physician there? Why then hath not the health of the daughter of my people gone up?’” Basil argued that God gave the exiled Adam and Eve agriculture to feed their families, weaving to clothe their nakedness, and the logos of medicine to heal their diseases. For every illness God created a plant, mineral, or sea animal to heal it, and then he gave human beings intelligence to find these remedies. Timothy S. Miller is professor of history at Salisbury University (Maryland). 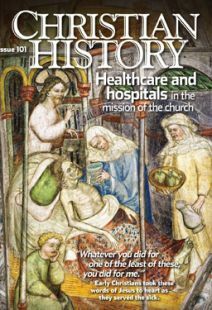 What would it have been like to receive care in a medieval hospital?